Where to invest is often the question real estate investors struggle to answer, which is unfortunate since location can make all the difference on an investors' returns. Solid investment properties can be found all across the United States, and to help you easily assess these neighborhoods remotely and without familiarity to the area, we’ve developed the Neighborhood Investment Rating (NIR). 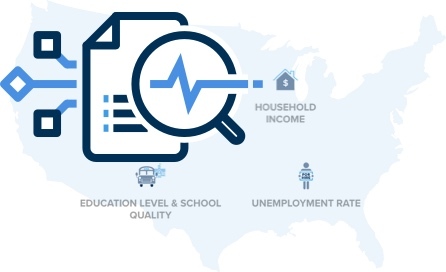 The NIR evaluates a neighborhood based on a variety of economic, environmental, and demographical charcteristics in relation to other neighborhoods locally and nationwide. The goal of the NIR is to help you quickly identify the ideal investment market that’s right for you and in line with your financial goals, without ever leaving your home. The data collected is weighted using our proprietary algorithms and models to generate a unique grade for each neighborhood. 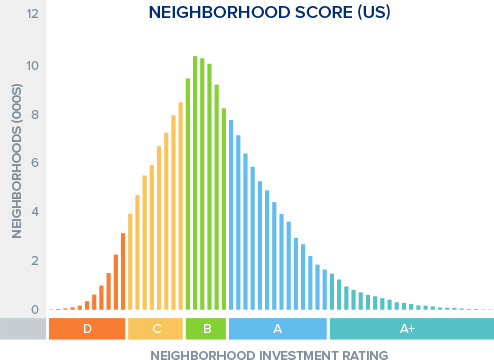 All neighborhoods are then sorted into five rankings from A+ to D, depending on the neighborhoods correlation to risk and reward. To simplify our millions of data points, HomeUnion® has developed an effective rating system. 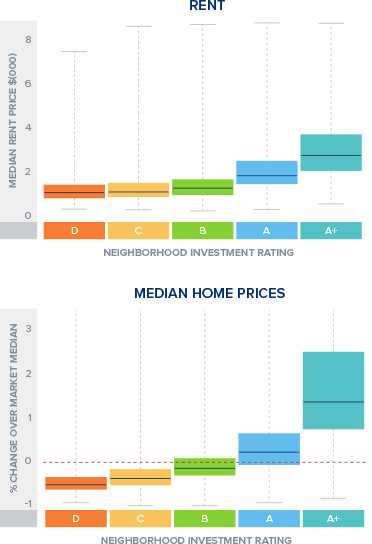 When looking at investments, all neighborhoods can be measured in a risk/reward scenario where the higher the risk the higher the reward. Local Experts – Our on-the-boots Investment Location Managers (ILMs) verify their territories and NIR in their locations to ensure it is working efficiently. Performance Metrics – We take a look at multiple correlated risk-and-reward factors to see how the NIR neighborhoods react in comparison to predictive trends. For example, median home prices and rent tend to be higher in A+ neighborhoods than D neighborhoods. Real estate investing can be exciting and profitable, and knowing how to properly select neighborhoods that offer a safe mix of risk versus reward can be difficult. 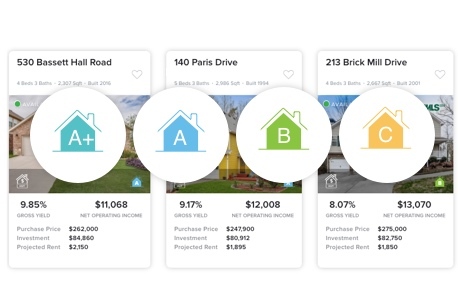 Using the power of data science and analytics, our team here at HomeUnion® looks at numerous data points to determine which areas will present the highest returns on investment. By starting with properly analyzed data and applying the criteria listed above, we present our customers with pre-vetted properties that are tailored for their financial goals.